NPR just had a piece on this twenty-year-old's adorable blog post that lists "Things We Say Today Which We Owe To Shakespeare," phrases such as "Fight Fire With Fire" and "Wear Your Heart On Your Sleeve," which she scrawled out charmingly on a piece of notebook paper. 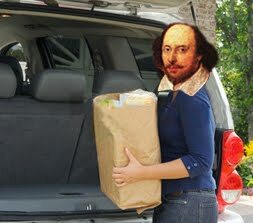 This post inspired me to Homebake a slightly different take on Shakespeare's wordsmithing. 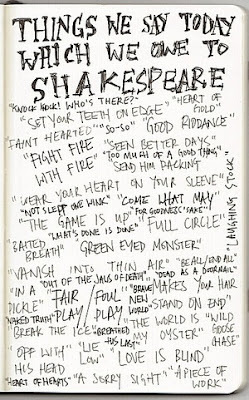 I call it Shakespeare Things We SHOULD Say Today . Meaning: Girl, you're talking like a naive fool! Meaning: "Excellent! Now I can die too"